The Trowel: What was the first community garden in San Francisco? Pam Peirce: It's hard to say; it goes all the way back to the Victory Gardens in Golden Gate Park during World War II. Up to a century ago there were market farms in and around the Bay Area. TT: What about community gardens as we know them now, on public land? PP: The City had an official community garden program before SLUG. In 1973, Robert Mendelson, a member of the Board of Supervisors, brought a motion to the Board to create a community gardening program. [The measure was passed.] Moscone was mayor then. The DPW [Department of Public Works] -- specifically the Street Tree Program--sponsored the program and hired a coordinator. 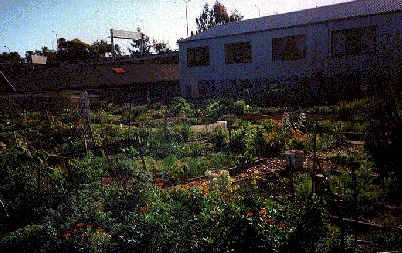 They used the greenhouse at Laguna Honda Hospital to grow plants which would be given to community gardens. They also helped people research sites for new gardens and get insurance. The Water Department was very cooperative in providing water hookups; the Recreation and Park Department provided tools and free compost from Golden Gate Park. Then they hired CETA workers. PP: CETA [Comprehensive Employment Training Act] was a federally funded job and education program which doesn't exist anymore but resembled our current VISTA program. At one point there were twenty CETA gardeners, and they not only helped work in gardens but worked with the neighborhoods to start new gardens and also started gardening programs in many schools and housing projects. TT: It sounds like "those were the days" for community gardens. PP: Yes, and that's when we saw a lot of gardens spring up rather quickly, between 1973 and 1977. Starting in 1977, things began to change. Mendelson went to Washington, Moscone was assassinated and Proposition 13 was passed. So we lost some friends in government and with Prop. 13 suddenly there was a lot less money. Feinstein had to cut programs, and one of the things she cut was the community garden program. They let the coordinator go and stopped spending money on it. So people would call and the line would be disconnected. The CETA gardeners were fazed out, and by 1979 the program was, to all effects, dead. The gardens went on, but compost delivery stopped and the insurance situation was muddy. If a key person moved away a garden might just fall apart. And many gardens had HUD grant money from as far back as 1976 that they had been unable to spend. Some of us--gardeners, CETA workers and others--began to research how much money was left in the grants, and looked for a nonprofit willing to sponsor spending of the funds. TT: So is that when SLUG was formed? PP: It wasn't until four years later that we were formally incorporated. At first we were just a loose association. We called ourselves the Urban Agriculture Coalition. With sponsorship from the William Hammond Hall Society, an organization of gardeners, we spent the HUD grants. Steve Michaels (a former CETA worker) and I carried out the grants in 1980 and we got funding for a second cycle in 1981. At the same time we kept on holding meetings and picnics to keep people informed and involved. Sometimes I think the heart of our efforts were the annual picnics we used to hold. They brought a lot of people together to talk about community gardens and how to keep them strong. They were potluck, but each of the regular Coalition members would donate a chicken, and one of the gardeners from the Potrero Hill Garden would bring his half-oil-drum barbecues and grill those chickens. We brought them in with chickens (and, of course, roasted potatoes and corn for vegetarians), and had great fun while we formed the vision that became SLUG! 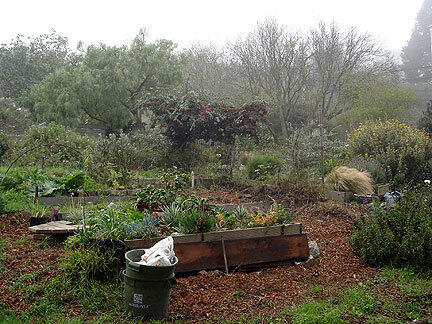 The San Francisco League of Urban Gardeners is hired annually by the Recreation and Park Department to maintain the community gardens around town. SLUG's Community Garden Coordinator meets with each garden coordinator and brings in repair crews and arranges maintenance and supplies. 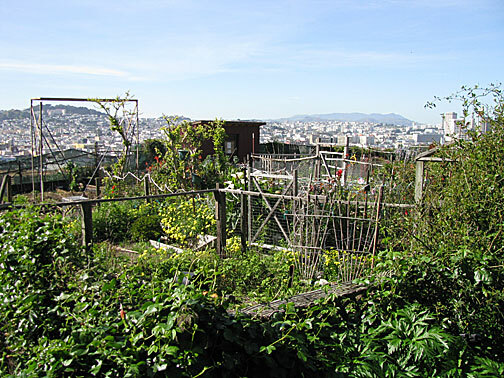 San Francisco started funding community gardens in 1974 when a charter amendment set aside property taxes to maintain and develop new park and recreation facilities. Since 1987 the Open Space Citizens Advisory Committee has approved Rec-Park's allocation to SLUG to help build, renovate, and maintain the community gardens. Mike Morlin, Assistant Superintendent of Parks was quoted in The Trowel, "Community gardening should be under the umbrella of Rec-Park support, but Rec-Park doesn't want to interfere with the garden community's decisions on how to run their gardens." Each of the more than 100 local gardens elects its own coordinator and directors on an annual basis. Plots are available to city residents on a first-come, first-served basis.